The classic Christmas photo shoot featuring klutzy kids climbing onto Santa's knee doesn't always go well. Add pets into the mix and you're just asking for trouble – gift-wrapped with a big bow. 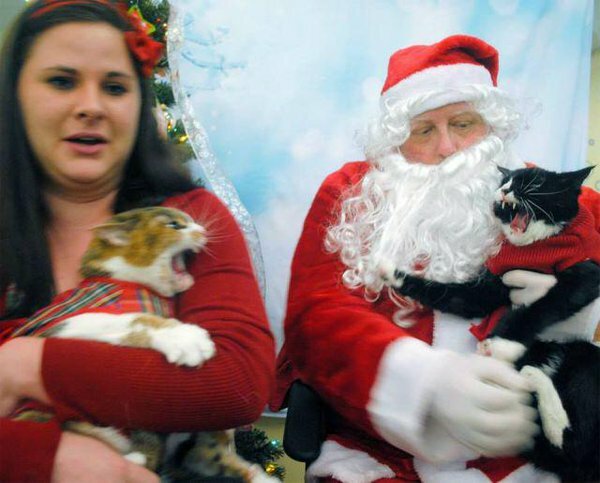 By all means bring your pet to have it's photo taken with Santa, though it would be best to ensure the venue, mall or event is OK with the idea beforehand. Some events specifically invite pets and their owners, often stating some portion of the proceeds wil go to a pet-related charity. Last but not least, consider how your pet might react to the situation – noise, crowds and the presence of other pets isn't as festive for them as it is for us. The Weekly Buzz! Scorpion Venom Highlights Cancer Cells, Priests & Cats, Mischievous Cat Behavior Explained, & More!